On the first day of the new year, I had to wake up early in the morning while most people were still asleep after celebrating the countdown the night before. And the reason for waking up early? 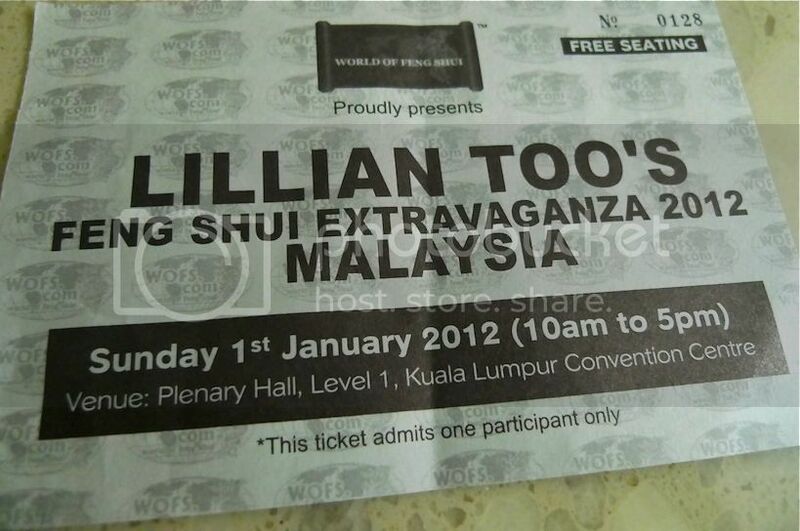 To attend the Lillian Too's Feng Shui Extravaganza 2012 at Plenary Hall, KL Convention Centre. I am still wondering why Lillian Too organized this event on 1st January - perhaps it's a good date for her? As expected, the hall was not completely filled up. Even last year's attendance was much better. I guess a lot of people would rather spend the first day of the new year shopping or relaxing at home than sitting through a whole day talk about feng shui! But NOT if you are a die hard fan of feng shui....or Lillian Too! As for me, I am not really a die hard fan of both, but seeing how accurate most of Lillian's predictions were last year, I did not mind going again this year! Besides, I had wanted to buy some feng shui paraphernalia which were selling at discounted price on that day. So before I talk about the outlook for 2012, let's look at some of the predictions by Lillian Too which came true last year. Of course, Lillian is no fortune teller. Her predictions are simply based on her analysis of last year's Bazi Chart and possibly to some extent the Flying Star Chart. Last year, Lillian predicted natural disasters to be on the rise with earthquakes, volcano eruptions, forest fires, typhoon and flooding. She also predicted quarrels and violence to erupt in certain parts of the world. I also remember her warning about a high profile assassination and at that time, she suggested it could be US President Obama's life that would be in danger. And those who play the stock market would remember well her warning to get out of the market starting from August 2011. Read more of what she predicted HERE. Aug 18th - US debt crisis peaked. US debt = $2.4 Trillion! As you can see from the events that happened last year, Lillian Too was mostly spot-on with her predictions. From the natural disasters to violence and riots, from high profile assassination to stock market fall, she had got it almost correct. It would of course be impossible for her to pinpoint which leader got killed although she just missed by one alphabet. 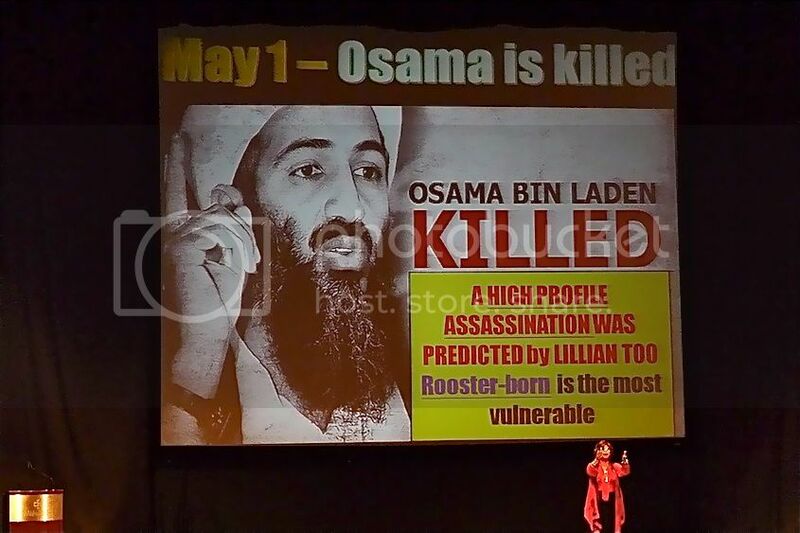 She predicted Obama, but it turned out to be Osama. Haha! The forest fires incidents were not really surprising seeing that there were 'hidden fire' in 2 of the 4 pillars in last year's Bazi Chart. The direct clashes of all the 4 pillars in last year's Chart also gave clear indication of a year filled with violence and conflicts. I find the accuracy of the Bazi Chart to be somewhat scary! 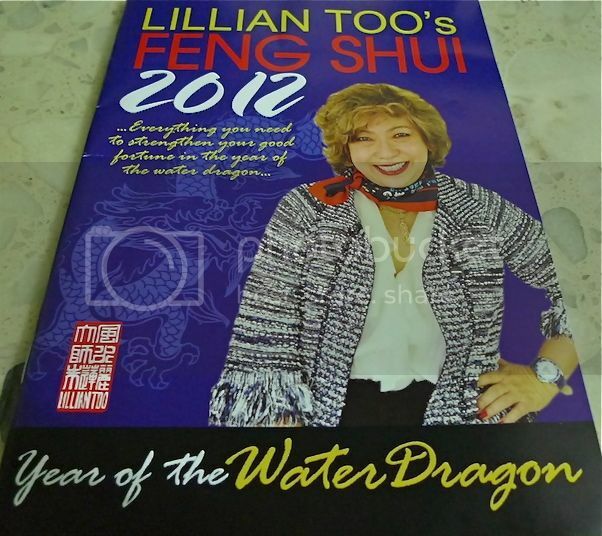 While 2011, the year of the Metal Rabbit, was generally not a good year, what does 2012, the year of the Water Dragon holds for us? One thing's sure - it won't be the year when the world ends! Lillian Too said she did not see any sign that the world is about to end soon. Instead she termed this year to be a transformative year. What does that mean, exactly? To find out, stay tuned for Part 2 where I shall cover the general outlook for 2012, what the Bazi Chart for 2012 shows, the lucky and unlucky sectors and directions, and most importantly, how to stay safe in 2012!